The new Antal block with revolving resin cheekplates and with a Dyneema snap loop protected by a polyester cover. A light and reliable solution that offers an easy, fast and safe connection. 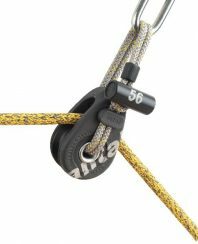 Dynablock is also suitable for a lashing with a thin Dyneema line. The resin sheave is on composite fibre bushing with two side ball bearings.